Hi Skip to My Lou readers! I am Beckie from Infarrantly Creative and Knock Off Décor. I love reusing materials many people throw away to make fun and unique gifts and décor. Today I am going to show you a way to upcycle those Crystal Lite containers you’ve been hoarding with a sweet printable for your child’s teacher. Inside the Crystal Lite containers are Whoopie Cookies…aka Mini Whoopie Pies. 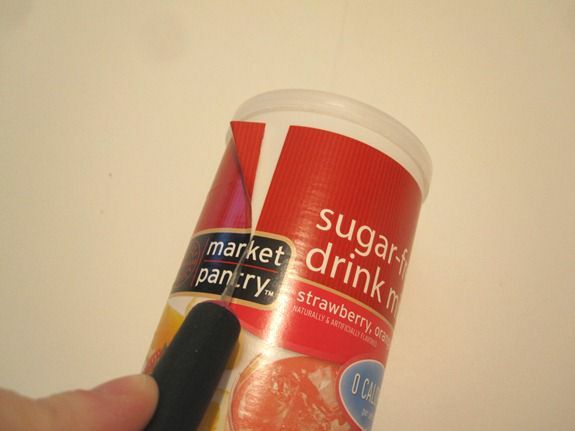 So take your Crystal Lite containers and remove the label with an Exacto knife. 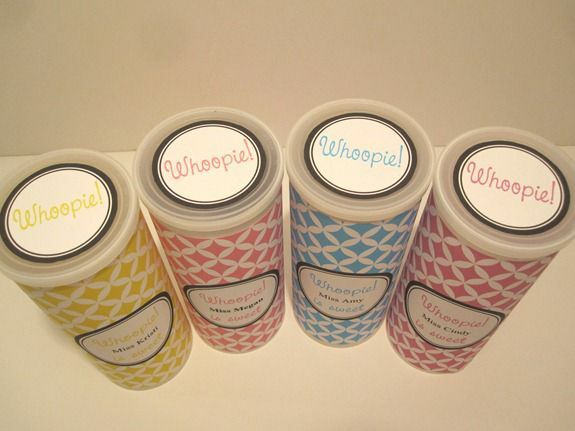 Print out the Whoopie Cookie printable in the color of your choice. I have pink, yellow, light purple and blue. Each of the printables is customizable so you can type in the name you want and then print it out. 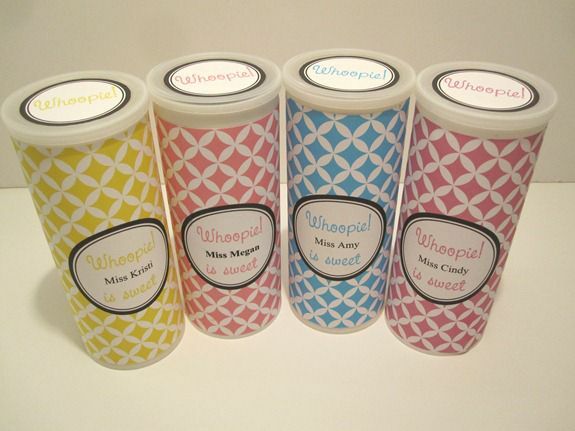 Print out the Whoopie Cookie Circle printable as well. 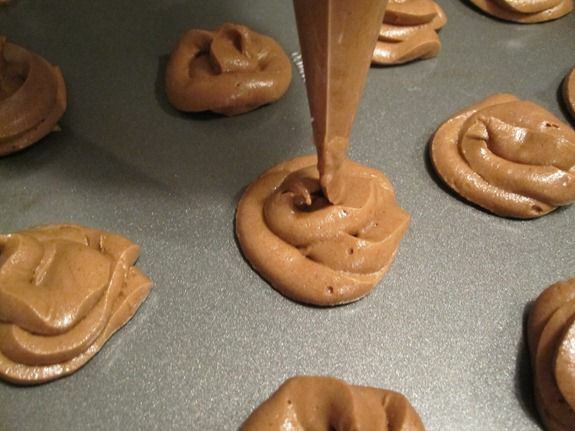 Spoon a dollop of frosting on cooled cookies. Add another cookie to the top. Thanks for having me Cindy. If you love craft projects, tutorials, DIY projects and knock offs galore come check me out! you are one of my favorite blogs. I can't wait until I open my e-mail I go directly to your. My grandchildren will love these for their teacher. i'm making these today for my anniversary! 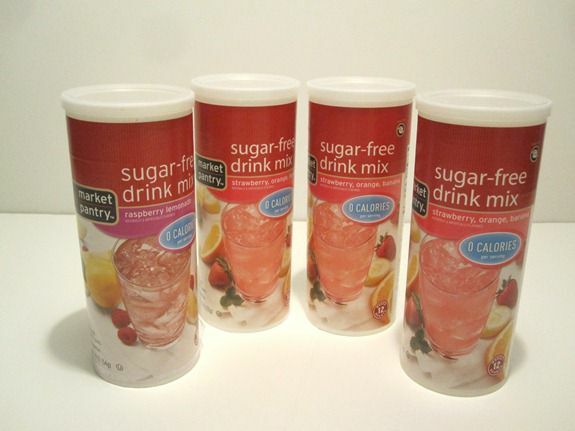 do you know how much I wish I had some of those drink mix canisters!? I don't drink that stuff though! What a bummer!! 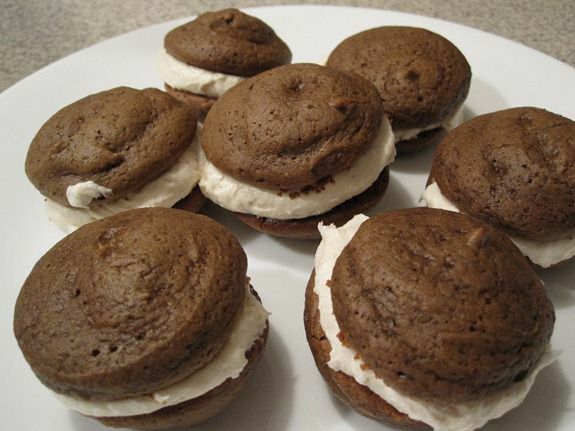 I love Whoopie Pies! This is a wonderful idea, and am excited about the very chic printables! Thank you Cindy and Becky! This is great! 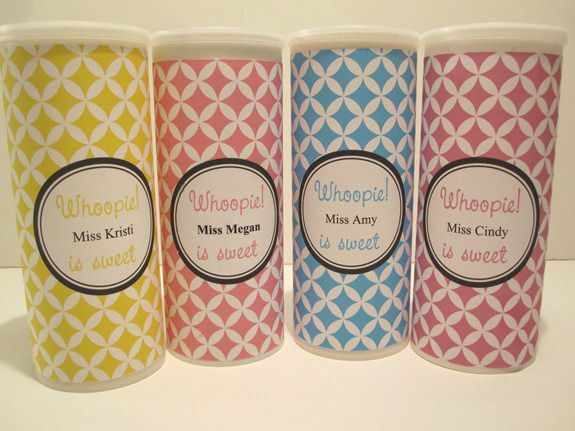 Of course you could fill it with another sweet treat as well-teh Whoopie! works as just an exclamation. I love this! I think this is my favorite TA gift I've seen in Blogland this week! Thanks so much for sharing Beckie! And Cindy, thanks so much for sharing so many TA ideas! Love, love this teacher appreciation gift. I knew I was saving those containers for a reason. Thanks so much for sharing. I use these containers for a lot of different things. For example, birthdays. I wrap them with "happy birthday" paper from the craft store (you can also use wrapping paper),fill them with candy, treats, etc. and put a bow on top with a name tag and voila. You can fill them with flowers on Mothers Day, etc. Fast and easy within minutes you have a "cheap" gift, but looks good. I would have SMILED so BIG if a parent had brought these to me when I was teaching Kindergarten! Beautiful and delicious! I don't know of a better combination. ;) Great idea, Beckie!!! These are great! I have some pretty designer paper that would look so pretty! Teachers will love getting this yummy gift. Thank you so much Aimee that made my day! What a fantastic and gorgeous idea! How cute! Love this idea...and the cookies! This is probably one of my favorites because it looks SO easy to do.